In an age of instant everything, the demand for live, remote and bi-directional broadcast interviews has skyrocketed in recent years. Whether it’s breaking news, the latest political stories, celebrity gossip or sporting events, viewers are looking to live video coverage for immediacy, excitement, and connection. And their appetite for live video shows no signs of slowing down. For broadcasters trying to meet this insatiable demand, getting expert commentary and opinion on air as quickly, conveniently and as reliably as possible is key to attracting and retaining viewers. Remote live interviews typically involve an interviewee on the ground and interviewer in a studio facility which requires bi-directional video and audio streaming over two separate locations. To achieve this, more broadcasters are looking to IP and the public internet for a cost-efficient and convenient means of transporting live video. However, the drawback of using unpredictable IP networks means contending with a host of constraints including latency, packet loss, and jitter as well as bandwidth fluctuations which can seriously hamper the quality of the viewing experience. Overcoming these network constraints is even more critical in bi-directional situations as round-trip streaming essentially doubles the delay and increases the potential problems associated with fluctuating internet conditions. Although the reliability and quality of live video streams have improved over time, as choice and expectations grow, viewers are becoming increasingly impatient. According to one recent study, the abandonment rate for live content is now surpassing that of video on demand, up almost 50% from 2017. As countless blooper reels can testify, conducting live interviews from remote locations can be stressful and fraught with potential pitfalls. While there are many variables outside of a broadcaster’s control (this TV gold still makes us smile), it’s entirely possible, with the right equipment, to eliminate some of the biggest technical obstacles of live broadcast interviews and keep your viewers watching. Here’s how. Often used interchangeably, delay or latency describes the degree of delay between the time a live video source is captured and the actual time that it takes for it to be displayed on a television screen or mobile device. For live remote video broadcasts, even the smallest amount of latency can be disastrous for both viewers and broadcast professionals alike, resulting in stilted exchanges, people talking over each other or long awkward pauses, all of which makes for an uncomfortable viewing experience. A video encoder specifically designed for live bi-directional video streaming can deliver the ultra low latency needed for remote interviews. Paired with SRT, a secure, reliable video transport protocol, broadcasters are able to deliver high-quality video over any network to different locations simultaneously, ensuring that remote interviews flow naturally with genuine interaction and are as compelling as those conducted in a studio environment. 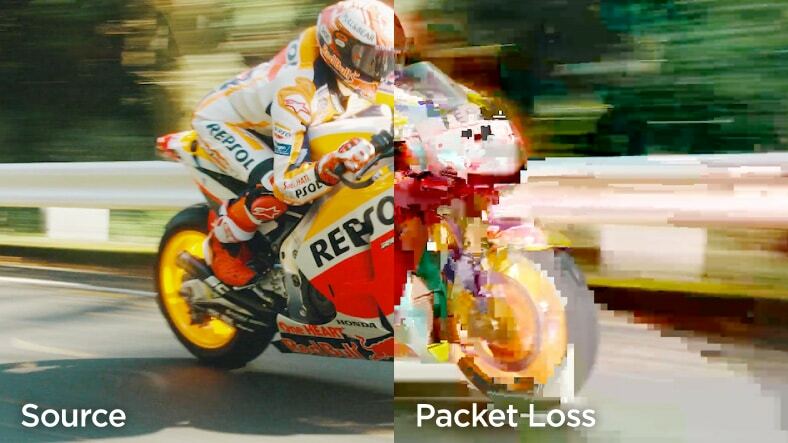 Although transporting video over IP offers a low-cost, high bandwidth solution to support live broadcast production workflows, the risk of packet loss and jitter caused by network congestion and encoder performance becomes far greater. For high-performance video signals, these impairments can result in significant picture quality degradations. To solve this issue and deliver pristine video quality, error correction techniques such as Automatic Repeat Request (ARQ), supported by the SRT protocol, ensures that all IP packets are received without choking the available bandwidth. The bandwidth overhead needed for ARQ scales in relation to the packet loss experienced, making it much more appropriate for the unpredictability of the public internet. If packet loss is minimal, so is the overhead. Optimizing streaming performance and ensuring high picture quality, essential to live video production, can be challenging when relying on unpredictable IP networks such as the public internet. Sudden changes in network conditions can completely ruin the overall viewing experience. In circumstances where continuous performance is required and losing a video stream is simply not an option, it’s essential that a video encoder can adapt to network conditions even when encountering significant network bandwidth fluctuations. Encoders with Network Adaptive Encoding can dynamically adjust compression levels to adapt to available network bandwidth in real-time. If bandwidth suddenly drops, the encoder will automatically lower the video stream bitrate to provide uninterrupted video with the highest picture quality possible. Want to see how the right video encoders and the SRT protocol, can help broadcasters stream high quality, low latency video from multiple remote sources? Take a look at this case study of how the German news organization, BILD, covered the German elections. To learn more about Haivision’s low latency video encoders and how they can help you deliver flawless video for your live remote and bi-directional broadcasts, check out the Definitive Guide to Haivision Video Encoder and Hardware Technology.